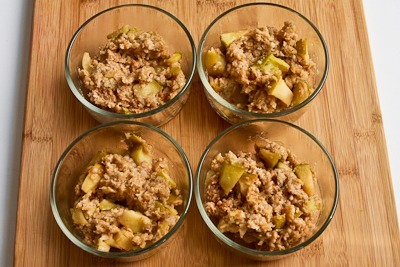 CrockPot Make-Ahead Apple Pie Oatmeal is a tasty breakfast for weekend food prep or a perfect option to make for guests during the holidays, and this tasty oatmeal treat is meatless, gluten-free, and South Beach Diet Phase Two.Use the Diet-Type Index to find more recipes like this one. Click here to PIN CrockPot Make-Ahead Apple Pie Oatmeal! I’m trying to post a meatless recipe most Sundays so people who are committing to Meatless Mondays can find an idea for the next day, and this week I’m sharing a very flavorful meatless breakfast option. This CrockPotMake-Ahead Apple Pie Oatmeal is something you make in the crockpot in the evening, and the next morning you warm it up in the microwave (or in a pan on the stove.) I’m a fan of Peanut Butter Oatmeal for breakfast, but I loved this idea for a new oatmeal option that’s quick and delicious. And who doesn’t like apple pie? Oatmeal is kind of a personal preference dish, so in this recipe I’m giving a range of ingredients and cooking times. You’ll need to think about how thick you like your oatmeal, how done you like it, and how sweet you’d prefer it and adjust accordingly. Personally I like my oatmeal so it’s not too runny, I like the oatmeal to have a little bite to it (but not too much), and I prefer the low end of the sweetness range. I made this in my small 2.5 Quart Slow Cooker, so if you only have a big size you may need to double the recipe. I used my apple corer to make it easy to cut up the apples. No need to remove the skin. I purposely cut the apples in different size pieces so some would dissolve more than others. I wanted chunks of apple in the oatmeal, but some dissolved apple as well. Put the apples, Stevia in the Raw (or your favorite sweetener), brown sugar (or more sweetener), cinnamon, and salt in the slow cooker. Then add the water and cook on high for 1 hour and 15 minutes. I ate some right away with a mixture of milk and vanilla soy milk poured over it, and I portioned out the rest into these containers which have a snap-tight lid and kept the oatmeal good in the fridge for quite a few days. To reheat, microwave for about 1 minute (or you can also heat it on the stove in a pan.) You may want to add a little bit of water when you’re reheating it. CrockPot Make-Ahead Apple Pie Oatmeal is a tasty breakfast for weekend food prep or a perfect option to make for guests during the holidays. Spray the CrockPot crockery container with nonstick spray. Then add the apples, sweetener of your choice (I usedStevia in the Raw), brown sugar (or more sweetener), cinnamon, and salt. Add from 3 to 3 1/2 cups of water, depending on how thick you want the finished oatmeal to be. Stir together and cook on high for 1 hour and 15 minutes. Serve hot, with milk or soy milk. This oatmeal can be stored in the fridge overnight and reheated in the morning. You may want to add a little water when you reheat it, then microwave for about 1 minute or heat for a few minutes in a small pan on top of the stove. I used my small 2.5 Quart Slow Cooker for this recipe, so if you only have a much larger size you’ll need to double the recipe.And you might want to double it anyway if you’re making this for weekend food prep. Recipe created by Kalyn with inspiration from several similar oatmeal recipes seen on Pinterest. This CrockPot Make-Ahead Apple Pie Oatmeal recipe isn’t low in carbs, and you’ll need to make it with all sweetener to make it low-glycemic. Made with all Stevia in the Raw or your favorite sweetener and eaten with low-fat milk or low-fat Vanilla soy milk, this recipe would be a good choice for phase 2 or 3 of the South Beach Diet. Use the Diet Type photo index pages to find more recipes suitable for a specific eating plan. You can alsoFollow Kalyn’s Kitchen on Pinterest to see all the good recipes I’m sharing there. Click here to see Slow Cooker / Pressure Cooker Recipes on my other site! I have a question that might seem silly – where you list the measurements for sweetener/sugars, it says "T" – is that Teaspoon, Tablespoon, or something else? Mindy, hope you both enjoy it! I came across your recipe tonight and just had to try it right away! My kitchen smells amazing right now, and I can't wait for breakfast! My 2-year-old son loves oatmeal, so I know he is going to be one happy little boy in the morning 🙂 Thanks for a good, healthy oatmeal recipe for the crock pot!! I think any apple that's recommended for cooking would work. Ask the produce person if you're not sure. Some types are too soft. Do you have to use granny smith apples? Or could you use any apple? Kat, I don't even want to think about how many CrockPots I have! This looks so yummy, what a way to wake up! Glad people are liking this idea. No particular reason I didn't use steel cut oats except that I'm a big fan of the extra thick oatmeal. I like the sound of pumpkin seeds, and oatmeal for dinner would work for me! Just made this tonight and am thinking it will be lucky to survive until tomorrow morning! haha! Sooo delicious! Thanks for the recipe, Kalyn! I'm thinking some pumpkin seeds might be nice in this. Why don't you recommend steel cut oats? What a great way to start the day! With the cooler weather these days, a nice oatmeal would hit the spot! I just made this the other day, but I used 1 cup steel cut oats, 3 cups water, and 1 cup milk. It was so delicious and smelled so good. I didnt actually time it, but I think it cooked on high for 4-5 hours. I like my oatmeal creamy, so the milk was great. It is definantly going to be my new breakfast staple. I divided into 4 micro safe bowls and have brought one to work with me every morning. So yummy! I have been enjoying steel cut oats for more than a year now. I cook them in my 3 Qt crockpot, over night on the warm setting. Simply 4 C of water, 1 C of plain soy milk and 1 C of the steel cut oats (sometimes add dried fruit). I set up after dinner, turn on at 10 pm and it is ready for 7 am. I put the extra portions in glass storage bowls and nuke them for a minute, add stevia and a splash of soy and breakfast in a minute is served. Make sure you spray the crock with oil/non-stick and your clean up is a breeze. Hi Kayla, loved this. I think I cooked too long, was a tad mushy. I'll cut down on cooking time next time – but yum!!! I love the idea of the "extra-thick" rolled oats. I'll bet they hold their shape but are not as chewy as steel cut. Another "must-try" Kalyn recipe for me. I'm thinking Christmas morning??? Deb, so glad you're enjoying it. Ruth, thank you so much for answering that. I will edit the post to share your comment! I make a big batch of a very similar recipe and freeze it in individual servings. Works great! My recipe uses steel cut oats (and cooks a lot longer), but I don't think that would make a difference. I smiled with glee as I read the title of this recipe. Just last night I was wondering about a recipe for oatmeal that I could cook on Sunday and eat all week. This is the answer! It is delicious, and my husband likes it! Wish I had more apples so I could make another batch. This is so not going to last until Friday! Thank you for sharing! This looks like a must try recipe! A great way to get more fruit in my diet. So glad people are liking this. I love oatmeal, but with the chunks of cooked and seasoned apple, I liked it even better. I have owned several crockpots over the years never using them enough; now this is a recipe I would embrace! What a grand idea! oh my! I love oatmeal for breakfast. This is like – oatmeal, applecrisp, apple pie all rolled into one. This would be one dynamite breakfast option. Thank you for sharing this!! I didn't like oatmeal growing up, but it is slowly growing on me. This sounds like a great breakfast option! Thanks for posting this. I have two apples left over from a Thanksgiving pie. Andrea, we were writing comments at the same time! Hope the boys like it. Barbara, I'm guessing it would might work, although I'd hesitate to leave the apples in the cooker all night and if you refrigerate them, that would add to the cooking time the next day. Vittoria, you could try it with steel cut oats, but they take much longer to cook in the crockpot. (See this recipe for Steel Cut Oats in the Crockpot. With steel cut oats you'd probably want to cook the apples and oats together the whole time, and I'm still not sure if the apples would be completely disintegrated after cooking for that long. I love this idea and my boys love oatmeal, so guess what they will have for breakfast tomorrow morning? Wow, this sounds really good! Normally I am not an oatmeal person, but then again, that's regarding instant oatmeal. I've always been told to make it myself. So I am going to have to try this one! Thanks! if you just used a heavy pot (cast iron) rather than a crock pot? This looks delicious! Can I ask why you don't recommend using steel cut oats for this recipe? I'd love to make it tonight, but that's all I have on hand. Thanks! This looks like having apple crisp for breakfast – I agree with Dara, the smell must be so warming. I wonder if this would work by cooking the apples the night before and then adding the oatmeal in the morning and cooking for an hour. I mean really…who DOESN'T want to eat apple pie for breakfast? This sounds delicious! Thanks Dara. It really does smell and taste good! I can only imagine how good this must smell in the morning! This would be such a comforting way to start the day.